Oh wait! I think I hear the Doorbell. . . Please. . . Come on in, it's terribly cold outside. 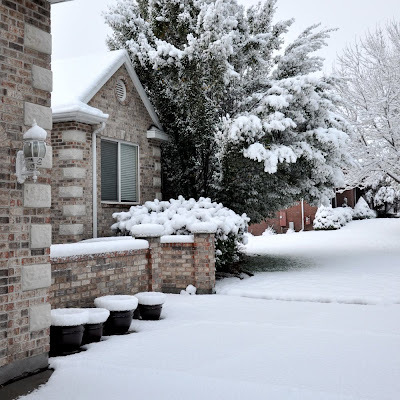 . .
Look at all the SNOW we got a few weeks ago!!! I'm just happy that you made it here safely! Here, let me take your coat and I'll put it in my husband's office. Just a sec. Okay, I'm back. I understand you had dinner at John and Monica's house last night. How are they doing? Well, I hope! 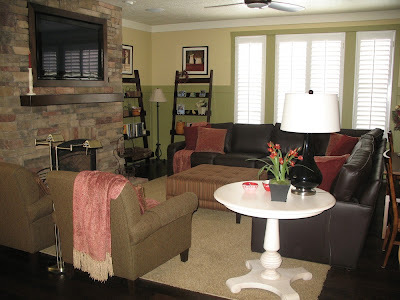 Let's go in the family room now so, you can sit by the fire and get warm while we wait for more guests to arrive. . . Yes? Oh, good. . . I've baked up a yummy dessert for you. You don't mind having dessert first, do you? Excuse me, but. . . did you have a question? Oh yes, it's called Strawberry Trifle and it's one of my family's favorite desserts. I made several copies and left them HERE on the kitchen counter if you'd like one. Just remember to pick it up before you leave. Would you also like a glass of punch? Yes? It's my favorite PARTY PUNCH and the recipe's so simple. . .
Just Mix: One 2-liter bottle of Cherry 7-Up and 1 Can of Pineapple Juice. Yep, that's it! You can easily double, triple, or quadruple the recipe depending on the size of your gathering. Just pour what you need into a punch bowl and add ice. It goes really fast so you needn't worry about the ice melting and diluting the punch. You could even freeze another can of pineapple juice and toss in some cut up pineapple and fresh raspberries. Just put it in a bundt pan to make a "Frozen Raspberry Pineapple Ring" that you can toss in the punch bowl just as you're ready to serve it. I think I need another cup of punch. How about you? How are you doing? Good. I'm happy to hear that. It sure has been nice getting to know you a little better. I know you like to sew and I was just wondering. 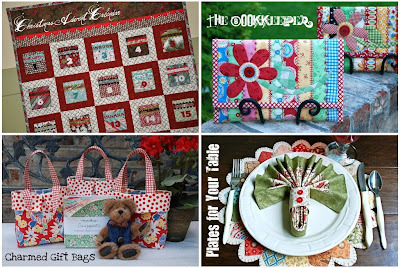 . . Have you had a chance, yet, to make any of my projects from Moda's Bake Shop? Oh, that's great! Which one is your favorite? If you haven't seen my Moda Bake Shop Recipes you can link to them HERE. Hey, look who's just arrived, it's one of our Special Guests. . .
Let me introduce you to Melissa Mortenson from Polka Dot Chair. She's such a great person. You'll be friends in no time at all. Did you know that she's one of the many wonderful Moda Bake Shop Chefs? It just so happens that Melissa has designed several of my favorite projects. So when you have a minute make sure to check them out at the BAKE SHOP. I sure hope you saved some room for more FOOD because we're headed on over to Melissa's Dinner Party at Polka Dot Chair. If any of you want to carpool I have enough seat belts for 7 people. Can any of you fit a few in your car? Oh! I almost forgot! Before we leave. . . I want to THANK ALL OF YOU for coming to my home for dinner tonight. Hey, dessert is dinner. hehehe! lol. It's been so much FUN having you visit and share in the big CELEBRATION!!! And one more thing. . . It's the GIVEAWAY! 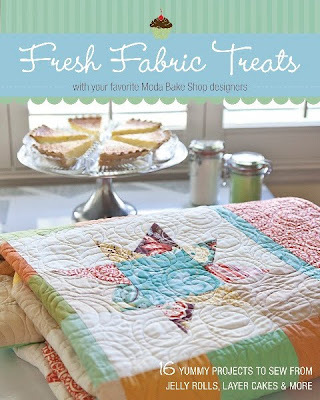 Each Moda Bake Shop Chef is giving away ONE BOOK of "Fresh Fabric Treats" and ONE Moda Pre-Cut. Each Chef will choose the pre-cut they'll be giving away at their dinner party. I've chosen Fat Quarter Bundles. FQ Bundles are the best! I really love having extra fabric after making a project just so I can use the scraps in other quilts or craft projects. Please Join me in THANK-ING Moda Bake Shop and Stash Books for generously providing the prizes for the Progressive Dinner Party. The Prize will be mailed once the books are available for shipping. Now HERE are the RULES & DETAILS of the Progressive Dinner Giveaway! Please leave ONE comment on THIS POST to be entered into the Giveaway. The Giveaway will END on January 27th and my winner will be chosen sometime that day by a Random Integer Generator. Please make sure I can CONTACT you. . . especially if you happen to win. Moda's Progressive Dinner Grand Prize Drawing: Make sure to visit ALL of the CHEFS on the progressive dinner tour and leave a comment on their dinner post, you’ll then be entered in the drawing to win $200’s worth of Moda pre-cut fabrics along with a copy of the book "Fresh Fabric Treats"
. . . Remember Dinner will be Served . . .
. . . for 4 more Days at the Following Homes . . . Your post made me smile. What fun! And congratulations on having one of your designs in the book. Your post is quite lovely. Thank you for making me feel so welcomed! You just made me super hungry!! Congratulations! What a fun book tour! I love Moda Back Shop. Looking forward to checking out your blog! Thanks for having us all over! What a lovely way to participate. Oh yum! Thanks for dinner and for sharing the recepies! I can't wait to try them out! That dessert looks delicious!! Yum! Lovely recipe it looks delicious. Your home and dessert look GREAT ! I haven't had the Strawberry stuff for a long time ; thanks for the visit and being such a gracious host . and thank you MODA !! Thank you for such a warm welcoming and the scrumptious dessert and drinks! I have room in my car to take a couple of people over to Melissa's. Congratulations on the book - love your tutorials on the Moda Bake Shop! Congratulations! Thanks for having us over- the strawberry trifle looks delish!! I love Emily's post-pub crawl for fabric lovers:) Thanks for making us feel welcomed! Thanks for the invitation, what a fun post. I love your apron. Strawberries are my favorite. Thanks for the great party. MMMMM.... Strawberry trifle.... Dinner? Nah - desert is always better lol! Thank you for having us in, and congrats on the new book!!! What a lovely way to start my Saturday morning....dessert first! Thanks for making me smile this morning and congratulations on being in the new Moda Bake Shop book. Congrats on the book, my mouth is watering for your beautiful desert. Love your tutorials on Moda Bake Shop, keep them coming. Congratulations on the book! Your dessert looks amazing. Thanks for the chance to win. Love this blog! Can't wait to try the Strawberry trifle! How do you make the Danish Dessert fruit sauce? Thanks for the great visit. Congratulations on all of your successes, I love that you share them with us! Your dinner party was lovely! I really want to make that punch right now, even though it's just me and my daughter here to drink it! Thanks for the yummy trifle. We're trifle buffs at our house. Love the punch....I love your projects and can't wait for the book!!! I certainly enjoyed dessert with you this morning. 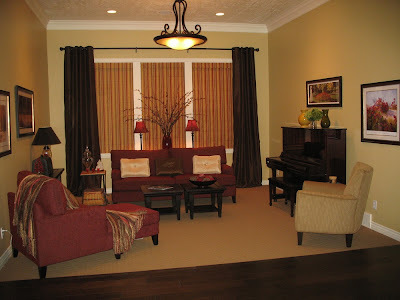 Looks like you have a beautiful home and thank you for sharing some of it with us. Congratulations on being part of the book. Oh my goodness! Do I ever feel welcome here! The strawberry trifle looks scrumptious! How long do we have to wait for more guests? My mom always made trifle for special occasions - everyone loved it!! Thanks for sharing... this might be a nice surprise for a treat after dinner tonight!! Mmmmmm. I'm new to your blog, so I'm going to go explore! This is one cool "dinner"! Thanks for hosting! I loved your clever post! Thanks! Thank you for the warm welcome to your home and the dinner party. I love trifle. Your Charmed Bags pattern intoduced me to Moda Bake Shop. Thank you! I love the idea of the book. Hope I win a copy! That strawberry trife looks fabulous! What a cute way to post a dinner party :-) I know my kids would love that party punch@! I know what I will be making this weekend. I like your post! I also LOVE the fact that you are giving away a fat quarter bundle! What a wonderful, welcoming post - I felt like I was welcomed into your lovely home. Hmmmm - strawberries, yes please. It was so nice of you to invite us to dinner. How very creative you are in all areas! Loved your introduction and your patterns and designs. Thanks for the entry drawing! I am enjoying this progressive diner so much! Y'all are so creative and great cooks! Thanks fir sharing such a neat idea. Have a blessed day! Thank you for the tour of your lovely home, and for such great treats! the snow looks so beautiful. Thank You for inviting us into your home. I thing this is so fun. I Never did anthing like this before. I am in awe of your dessert. Thanks for the giveaway. Cute post! The Strawberry Trifle looks great too but I don't know how to make Danish Dessert. My son always has strawberry shortcake for his birthday cake - the trifle would be a good variation. thanks. Here, let me take my snowboots off. Ah, so nice warming up my toes by the fire. Ah thank you, Strawberry Trifle sounds wonderful. I'll have to remember to pick up the recipe before I head over to Melissa's home. Oh my, that was delicious. Just a small glass, please of Party Punch. I'm already so full. My tote is amost full of Fresh Fabric Treats and there are still FOUR days left. What a great hostess. And such a delightful time. But I best save a little room for the next stops on this wonderful Progressive Dinner. Your post was very creative and fun to read! M-m-m, strawberries! Such a delicious dessert! Greetings from Ukraine! Thanks for your projects! Thanks for inviting us into your home. Love your 'recipes'! I love your dessert! Your post was great, it def made me smile. I enjoyed your post! The trifle looks delicious! Thanks for the opportunity to have some fun with this generous event! Whew, I've been running around this morning trying to catch up on the commenting for previous designers. Thank you for inviting me in and the delicious dessert! You and your home are lovely... Gotta go -- I'm off to Polka Dot Chair! I loved your post! Dessert first always works for me. :) I will definitely have to try that recipe. Congratulations on your book! Your dessert looks yummy! Thanks for the recipe and the giveaway! Thanks for inviting us into your home. It is beautiful and welcoming! I love the trifle! I'm am having so much fun with the Progressive dinner. Great idea! I enjoyed having dessert first tonight. I can hardly wait to see this wonderful new book. I've made your charmed gift bag and loved it! Thanks for the recipe and giveaway! Thanks for the desert... dinner! Your faux cami is SUCH a great idea! Thanks for the recipes and showing your bakeshop items. Your post was fun to read, I just love that punch recipe! Actually, the Moda Bake Shop recipe I'm working on right now is the advent pockets! I'm very excited to get it finished for this coming Christmas. Your dessert looks WONDERFUL! Thanks for the recipe and the chance to win! Congrats on the book! Your Hugs and Kisses banner is one of my favorite recent projects. What a cute post! I felt so at home! Congrats on getting published! Oh I love your dresden plate placemats! Thanks for hosting! It was fun! I love how creative all the bakers are getting with their progressive dinner posts. They are become a highlight in my day. Thanks for hosting! The trifle recipe looks great but I have one question: What is Danish Dessert? I have never heard of it. My favorite precut is a FQ bundle too. I am really enjoying the dinner party. I will be happy to ride with you to the next stop. Save me a seat belt. I certainly don't mind having dessert first.. in fact if you saw me.. you would know that I often DO! That trifle is gorgeous! And a punch recipe is a great idea! No one I know serves punch anymore, but who doesn't like punch?! That strawberry dessert looks especially yummy!! Congratualations on being included in the book. I'm looking forward to seeing your project. Thank you for such an imaginative and warm tour of your home. The strawberry trifle looks awesome! I've visited your blog often, usually without a comment. This time wish to say, "Congratulations on being published!" And, thanks to Moda for the sponsored progressive dinner. I love your patterns and want to make the dresden plate placemat. Congrats on being published...oh and by the way thanks for dinner and the great recipes. I am new to your blog, and I didn't realize what I've been missing! Congrats on being published in that lovely Moda book! Thank you for your warm welcome and opening up your lovely home and showing all your fantastic work and sharing your recipes. That strawberry trifle looks yummy! Thanks for sharing. The book is sure to be a winner! No joke, I had that "strawberry dessert" (that is what we call it) last night! Thanks for dinner Kim! I enjoyed every minute of it! Such a great post, love how you did it. I love the Plates for your table and I did manage to get one made and love it. I have the table runner put together, but not completely quilted, have to get that done! Thanks for the delightful post and welcome into your home..congratulations on being apart of the new book. I made the crochet holder you designed and it's probably one of my most favorite. Aww, you are so sweet...I felt like I was visiting my aunt's house for Thanksgiving like we used to be able to do. :) What a homey and creative way to do this post. :D Thanks for the welcome! Oh what a grand hostess you are! Thank you for the warm welcome and visit :) The yummy foods and drinks and wonderful company ... can't be beat! I would love to own a fat quarter bundle ... so many possibilities. Thank you and look forward to visiting with you again. What fun! Thank you for the opportunity. cynthiamrutledge at aol dot com. Yay! Can't wait for the book. Dessert looks yummy! 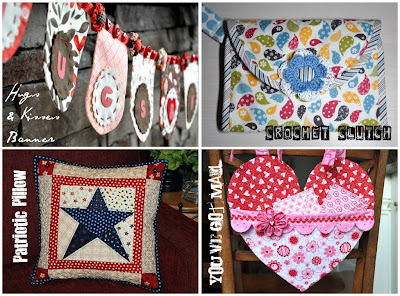 Your hugs and kisses bunting is so cute! Thank you for having us to dinner. The Strawberry Trifle was delicious. Can't wait for the book to come out! Kimberly you are an absolutely delightful host - I most certainly will have some dessert and yes maybe a glass of punch as well. Thanks for the invitation. Delightful!! This has been so fun to visit all the blog reading all the recipes and seeing all the cool stuff everyone has made. Love your Charmed Gift Bag! I love the super easy punch recipe! Can't wait to try it! That was the most creative post!!! I enjoy your blog, thank you. I love how you staged it! Thanks for the recipe as well. Thank you for the warm welcome on such a cold day. Your house looks so inviting. Thank you for the punch. It was just what I needed. loved your post! can't wait to see the book!! I enjoy checking out your blog. I get inspired and just want to run and quilt for the rest of the day. Thank you for the wonderful welcome! I have never been to your place before and I must stay and look in the cupboards a bit! Wonderful post, so very welcoming! And thank you for the recipes. Congratulatiosn on being included in the book. I had so much fun at your dinner party. Now I think I will go home and make a "bookkeeper" for my iPad! this dinner is so much fun. love your projects. Thanks for welcoming me into your home. I love all of your bake shop projects. Congratulations on the book. I like your dresden plate pattern and the pattern for your kindle. My husband bought me a kindle for my birthday last year and I still need to make a cover for it. I'm loving this giveaway! So fun to visit all these bloggers I hadn't yet discovered! Thanks! The dessert and punch were delicious! Thank you! I'm off to the grocery store now, LOL! LOVE your post!!!! Vert entertaining - I feel like I was at your home. Congrats on being in the book! The strawberry trifle and punch look delicious. Lovely home, thanks for inviting us! You design such fun tutorials. I have enjoyed seeing them at the bakeshop and have a couple on my list to make when I get time! You're trifle looks amazing! I would love to win a copy of this book! You have a beautiful home, and that dessert looks fabulous!!! Congrats on being in the book. Good luck everyone. Thank you for inviting us into your home. It was a lovely party. That punch looked so easy, I might have to try it at a birthday party tomorrow. what a fun post!!! your projects are fabulous and i cant wait to see the book! Thank you for a waem womderful welcome! I am going to stay awhile, take off my shoes and look thru your sewing room if you don't mind! Thanks for dinner Kim. Your home is lovely and trifle is one of my favorite desserts! The punch is just what I've been looking for for a get together next week. Thanks for sharing your blog, and the opportunity to win!! I've never visited your blog before and can't believe what I've been missing out on! You've Got Mail...Adorable! Una casa preciosa !!!! Y esas fresas tienen una pinta estupenda. Enhorabuena por participar en el libro. I can't wait to see the book! All the projects in the bake shop are so great this book has to be fabulous! What a bright and cheery post!! I like all of your Moda projects but my favorite is a Halloween quilt you made with a wedge ruler sometime back. I bought the ruler and I have now collected enough Halloween fabric to make me a quilt. Have you made anymore quilts using the ruler? Thanks for the recipes!! I am going to use them at my next family dinner. I love your blog. It is so fun and colorful. I will be visiting again. Great post - amazing trifle! We can eat that for breakfast right :) I made the kindle keeper from your tutorial and I love it! Thanks so much for sharing with all of us! Oh! You and Monica must have spoken after my visit there because I was lamenting the fact that my daughter's school doesn't do Valentine's Day and how I was going to do my own - blah, blah, blah... and here you have MORE great projects for me to use! LOVE! Hi Kinberly!! As always you are so warm!! Love to read your blog every time!! !I´ve seen your designs at MBS and really like The BookKeeper!! I´d love to win, cross my fingers!! Hugs and greetings from Argentina!! Cute post! I truly felt like a guest in your home. :-) Yummy looking dessert, too!! Love the Strawberry Trifle! What a great dinner where you get to eat dessert first. Congrats on the book. I can't wait to get my copy. Now I want dessert for breakfast - looks so good!! Can't wait until this book comes out, thanks! That strawberry trifle looks delectable!!!! Thanks for the fun giveaway! Congrats on making it in the book! SO EXCITING!! Very clever post- I enjoyed it! Thanks for the chance to win! Wow! A fat quarter bundle would be just super. Strawberry Trifle one of my all time favorites! Thanks for a lovely time. Your post made me smile!! Strawberry Trifle...it doesn't get much better than that!! Congratulations on the book. I have read your blog regularly for a while and really enjoy it. Your house looks lovely and welcoming. Thanks for the "evening"
What a great party! Thanks for the recipes and the giveaway! Your Trifle looks absolutely scrumptious! Thanks for hosting the dinner for MBS. Can't wait to try out the projects. Such a cute post! I would love to try the fat quarter bundle (hint, hint). I've never tried it before. And I can't wait for the book!! Can we be friends? I simply loved my time here! Thanks for the projects. . . .I can't wait to get my hands on the book! What a fun post! Thanks for hosting! What a cute post - I love your living room!! Thanks for the recipe and the giveaway! I love your Dresden Plate tutorial!!! Would love to win the Book and the Fabric! your 'recipes' at the bake shop are so cute! can't wait to try one! and congrats on being published - that's really awesome! Wow! Your trifle looks yummy! Thanks so much for having us and for the chance to win! Your pictures made me miss my home town. Thanks for the invite. I am having so much fun visiting everyone's dinner party! Thank you so much for your warm welcome and congratulations on the book! Lovely photos and a warm welcome! Thank you for taking such great time for us to visit. I love the Christmas count down quilt you designed and can't wait to see your contribution to the book. I love the charmed bags. Thanks for sharing your patterns. dessert is always better when eaten first. thanks for the yummy trifle. your post was so much fun. i felt like i was really there. I am enjoying this progressive dinner. Congratulations for being published in the book! Moda is so much fun! Thank you so much for the recipe and for participating in the giveaway! I just love your projects and the bookkeeper is on my 2011 Stitch List (for my Kindle)! Thanks for having us over! You have a beautiful home! Congrats on the book! I love the punch recipe YUM! Congrats on the book too. Your blog is bright and cherry for sure. What a well done dinner party! Your trifle is gorgeous! So happy MBS is putting out a book. Looking forward to more wonderful recipes. Thanks for the lovely giveaway! Oh, my, what a beautiful house! And SUCH a gracious hostess! :) Thanks for inviting me over. Love having dessert first, too! Thank you for the chance to win, too! Dessert first! I love it! I really like your Moda Bake Shop projects. Wow! 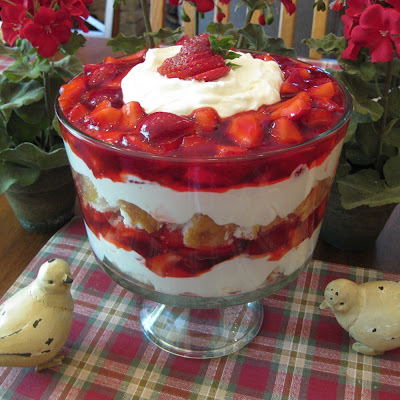 That strawberry triffle looks delicious! That strawberry trifle looks delicious and I love your apron!!!!! I read your blog all the time. And I just loved having dinner with you and your friends. Loved the dinner at your house and your home is lovely. Thanks for sharing your work with us! The Strawberry trifle was delicious and you have a beautiful home. Thanks for your hospitality! Thanks for a very generous giveaway and a very clever post. Dessert was delish! Thanks for the recipes. Love your blog and the projects you've shown on MBS. i always want to start with dessert. :D congratulations on the book. i'm excited to see the projects! Dinner was delightful! Thanks for such a fun time! I love your strawberry trifle! Your Hugs and Kisses banner is one of my favorites! Congrats! The book looks amazing!